What moves you? What gets in your gut and propels you into the world? Many have no great cause. The opening of Oldboy Reminds me of Rebel With Out A Cause, where after a display of public drunkenness Jim (James Dean) is brought into a police station and dumped in a chair where he mocking yells along with the siren of a police car. 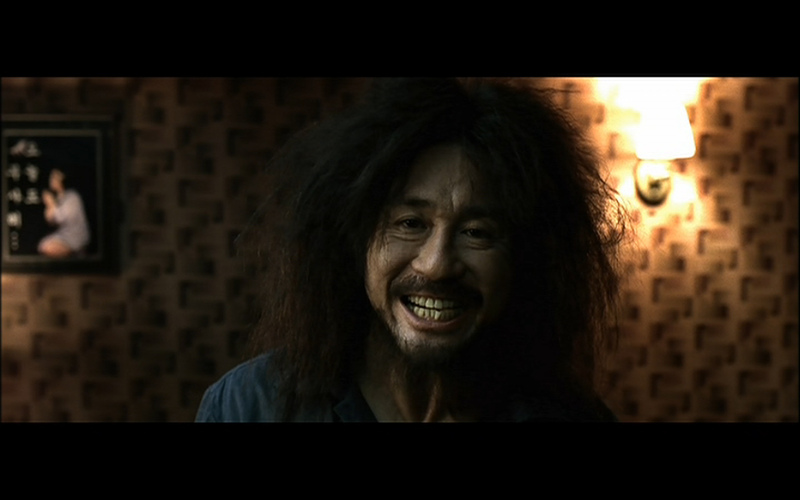 The first scene in Oldboy that keys us into the temperament of Dae-su (Min-sik Choi) is of a similar nature. Dae-su is drunk and sitting in a police station acting a fool. First arguing, with the police, then later attempting to urinate on a potted plant. Eventually, he is handcuffed to a bench and wedged between two more hardened looking felons. The framing of the scene contrasts Dae-su's childish antics against the sobering crimes and the criminals with grimaced faces that commit them. What is Dae-su cause? Dae-su is a husband and father, yet abandons his sensibilities to drunken escapism. Why? Fatherhood and husbandry are clear traditional anchoring points which tend to serve as clear causes of adult-like behavior. Dae-su's association with his position in his family is clearly hindered by something. The only other attribute the film provides us with is Dae-su childhood in relation to Woo-Jin Lee, the primary protagonist who imprisons Dae-sue for 15 years. In these flashbacks we learn that Dae-su has low regard for the reputation of others and maintains a juvenile attitude towards life. To Dae-su the world and the people in it do not have significance in such a way where they require him to move through the world with care or a minimal of empathy. People are not the cause of who he is. Dae-su's causality springs from egotistical motivations rooted in an apathetic non-relationship to others. Dae-su's imprisonment forces him to confront himself (which he may have never done otherwise) and find new causes for his behavior. As the years passed by he used the TV to learn how to fight so he can take revenge and creates a long list of potential enemies who may have had him locked up. Dae-su connects his past behavior to his current situation. Although, without a knowing the other's motivation behind his imprisonment, he perpetually circles the other's desire. Seeking to make sense out of his situation. What this forced Dae-su to learn is that the actions he takes in the world have a causal relationship to the people who live in the world. In realizing the world's relational to his subjectivity Dae-su also establishes the reverse connection between himself and the world. Dae-su finds's his cause. After Jim Stark (James Dean) is released from custody, he returns to the daily life of a high school student. Seeking to isolate himself from others, and maintain a nihilistic relationality to the world he pushes others away and distances himself from others. As we know, Plato pushes himself upon Jim and eventually Jim develops a connection to Plato. This relationship forces Jim to think outside his own ego, and into the complex web of social relationships; what others are for him, and what he is for others. In a similar fashion, Dae-su is tossed into the world. He awakens from a box, on the grassy top of a building, where he is confronted by a man who is planning to commit suicide by jumping off the building with his hideous dog. Dae-su grabs the man by the tie and demands that he hears Dae-su's story before he kills himself. Dae-su unloads his story of 15 years of imprisonment, and when he is done, the suicidal man attempts to tell Dae-su his story. Abruptly, Dae-su stands up and walks away. So, while Dae-su sees the need for recognition he is not aware that without mutuality his personal recognition is without substance. Dae-su is shortly confronted with a sushi girl who falls madly in love with him. 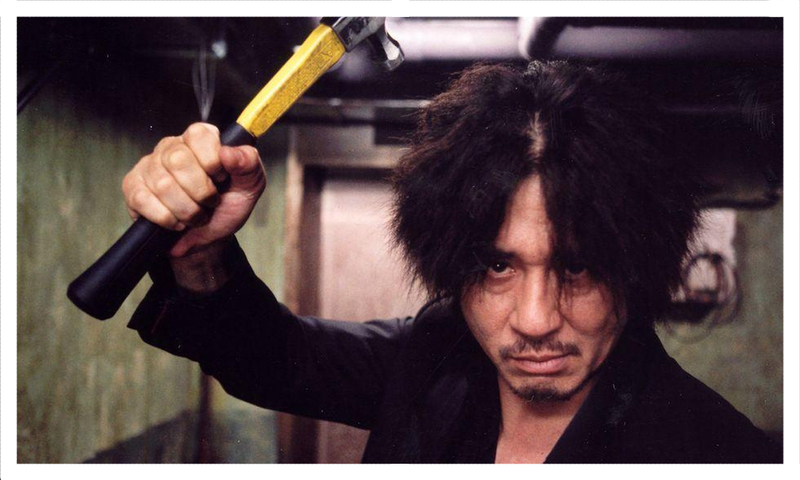 The difference here between the two films is that Oldboy unravels the ideological girders that structure the protagonist's journey through the narrative. Both characters are trapped in networks of social relationships which condition their opportunities to be. Jim is the son of an emasculated father and an overbearing mother. Living a life in a household where parental authority swings violently between ruthless criticism and submission, has left Jim crippled with a bi-polar self-concept. On the other side, Dae-su's subjectivity is more obviously manipulated by outside forces seeking to compel him to self-identify with a specific cause. The desire to know why. Cast out in the world, Dae-su goes in seeking of the rationale behind his imprisonment. Not knowing that Dae-su was subliminally manipulated to into relationship with the sushi girl, nor does the sushi girl know that her life has been nudged into a set of potentialities towards Dae-su. Let's see if we can saw through this via Plato's cave. In the allegory of the cave, a set of people is chained to chairs and confronted with a play of shadows on the wall. The shadows become so enrapturing that they become all they know. Eventually, one of the prisoners turns around, frees themselves from their slavery and stumbles out of the cave. Once outside the person becomes convinced that the world outside of the cave is better than the one inside of the cave, and returns to is comrades seeking to convince them that there is a world outside. But they aren't buying it and become more convinced that the shadows are all that there is. The question here is not which reality is more real; the one in the cave or the one outside the cave. But how did they get into the cave in the first place? There must have been a cause that led the prisoners to the situation they found them self in, but we are not told why they are prisoners. The cause of their reality becomes something for amnesia. A variable lost or suppressed to the conscious, or simply not worthy of memory. This amnesia is like childhood amnesia, the phenomenon where we forget our personal histories of or pre-linguistic self. There is a sense in which Woo-Jin Lee plays a kind of God-like character who a priori invests Dae-su's world with a specific set of meanings and drives that Dae-su is not consciously aware of. This work's upon the same structure that the question, "have you found Jesus?" The idea being that Jesus is hidden in your and your world in such a way that you are born into it unaware, and once you find Jesus, God or Joseph Smith then you come to the realization that your choice of deity was already embedded into your lived reality. Dae-su's confrontation at the end of the film forcibly pulls Dae-su out of the cave, but what he finds there is an evil about himself so great that he wishes he had never known. So while the reality of Dae-su's actions was always-already attributed to his behavior he was not aware until he found the hidden God like memory that redistributed meaning and brought about a personal revelation.